Today, green is the new trend, so why not recycle blue jeans and bring them up to par with modern fashion? Not only does this save you money, it also allows you to show off your sewing skills, wear an outfit no one else owns and brag about fitting into your old jeans. You can recycle your entire family’s blue jeans and give everyone a trendy makeover, make household items or donate the jeans to green companies that create insulation from denim. Like wine and cheese, jeans get better with age. Unfortunately, as they become broken in and comfortable, they also begin to fade, tear, fringe at the bottom or go out of style. Let this become the perfect time to revamp your look. Depending on your age and personal style, you can do a lot with old jeans. For instance, an old pair of bell-bottoms can turn into a pair of capris for mom or hip-hugging shorts for the teenage girl. You might recycle blue jeans originally decorated with ‘bling’ or rhinestones by pulling off the decorations and replacing them with beads, feathers, tiny jingle bells or other embellishments. A once-common way to revamp your jeans was to cover rips with patches, but unless this trend comes back into style, you can avoid it in favor of fixing rips by other, more stylish means. Modern fashion features a lot of layers, and designers are selling torn jeans with sewn-in leggings, so if your jeans have a rip, make it bigger, add a few more and throw them on over your favorite pair of leggings. Another fun way to recycle blue jeans involves changing the color of the entire garment or perhaps just a section. To change the color of your jeans, rather than using tie-dye, airbrush them using a stencil. Stencils come in a variety of shapes and sizes, so you can add a single large design or a few small ones, and you can purchase vintage tints to make your jeans look old but cool. Denim has many benefits that allow it to fit easily into the toughest parts of your home. 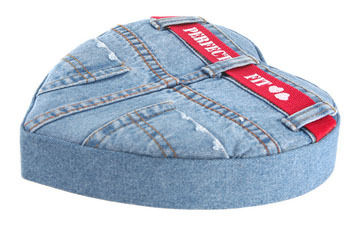 For example, you can recycle blue jeans by turning them into potholders for the kitchen or kneepads for use in the garden. A denim-upholstered chair or side table adorned with studs gives off a western vibe, while cup cozies scream fashion and comfort. Quilts, hanging sleeves for storage, a lunch sack and a rice pack for hot or cold therapy are other interesting ways to repurpose blue jeans around the house. You might also enjoy making denim pillow covers, a hamper liner or an ottoman cover, as well as smaller items like picture frames, book covers and totes. 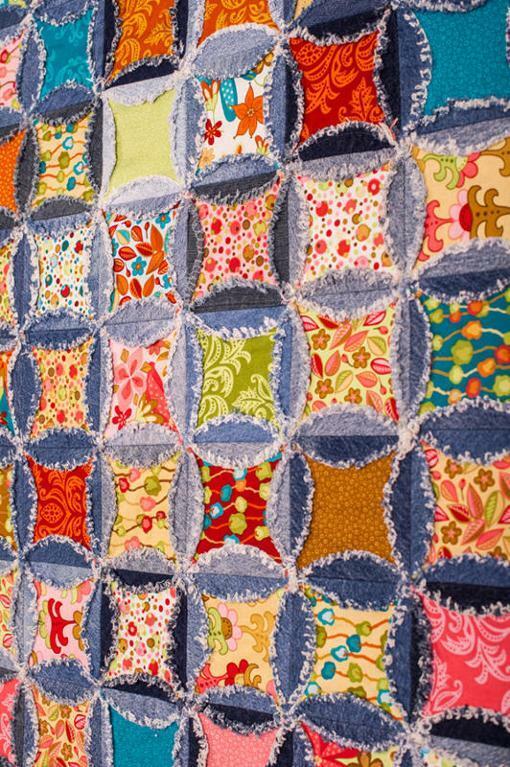 This incredibly fun quilt pattern is from Craftsy - A great way to recycle jeans and fabric scraps! If you want to recycle denim, but don’t want to do any sewing, look into the many green companies that have found interesting new ways to utilize the strong, durable material. One company, Bonded Logic, uses jean remnants from factory floors to create ecofriendly insulation for homes and buildings. The company also accepts jeans as donations from consumers, but you have to pay to ship the jeans to Wisconsin. If you do not mind the small shipping cost, your donation spares the environment from the toxic dyes and chemicals used to make everyone’s favorite piece of clothing. A handful of other green companies have found ways to create paper, pencils, coasters, piggy banks and other uncommon items from recycled denim. These products provide a great alternative to waste, save trees and never go out of style. From rhinestones to quilts to coasters, whatever your purpose, just recycle blue jeans.